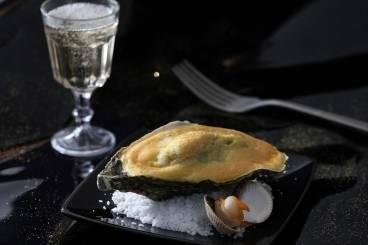 This shellfish is widely consumed raw, where its salty taste and fleshy texture can be most fully appreciated. 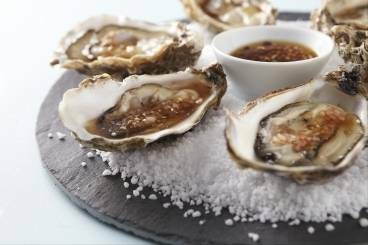 Oysters can also be grilled and served with a variety of sauces to make a sophisticated starter. A classic way of serving shucked oysters. Red wine vinegar and shallots with lots of freshly milled black pepper. Hot oysters with braised leeks and a champagne sabayon cooked under the grill. Crispy oysters with a light soy dressed wakame salad. A perfect pairing for some clean and crisp english bubbles. Grilled oysters with a home made coriander, parsley and shallot butter. Learn how to open, prepare and serve oysters with three different sauces and toppings. Kilpatrick, Rockefeller and Mignonette. A delicious combination of flavours that would suit any green vegetable, but especially kai lan,Gai lan, sprouting brocolli.